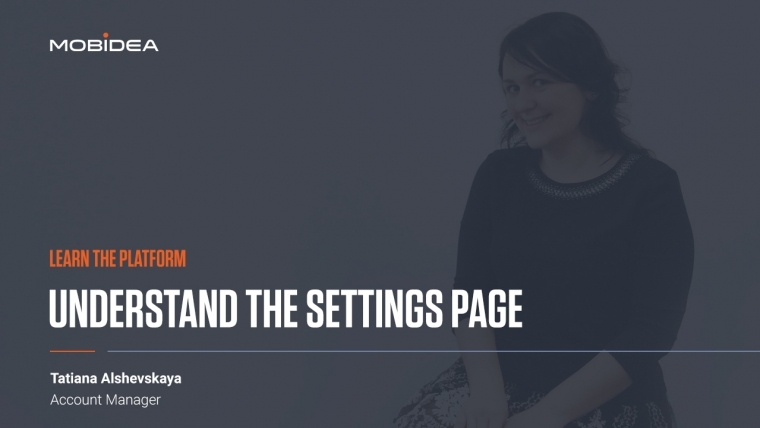 Don’t feel like you have a firm grasp on the Settings Page and need some expert help? Check this video and let Tanya show you how it’s done! Hello! My name is Tanya and I am an Account Manager on Mobidea. In this video I would like to tell you about the Settings section on your account. In order to access it, you need to click on the wheel. So, let’s start! 1. On the first tab, Custom domains, you can set the Tracking domain, Cloaking domain and Root domain. In the Tracking domain you can add your own custom domain that will be used to generate your Tracking URLs and ClickURL in order to start using the Tracking capabilities of Mobidea. The Cloaking domain is used only when the option to redirect visitors using Meta Refresh is activated. Root domain can be set in order to redirect the users from the URL with wrong campaign ID or wrongly-written domain. The purpose of this is to never lose any traffic. 2. If you want to promote Mobidea offers using your own Landing Page, you need to configure a Click URL on the second tab. This Click URL will be placed on the call-to-actions of your Lander. The Statistics API is used to get all your stats via our API. You can customize the feed by choosing the fields you want to be returned with each offer. The Offers API allows you to get a feed with all our offers. By selecting the fields, you can also customize it. On this page, you can set the Global Postback that’ll be used as your default Postback for all your Smartlinks and Offers. If you use one of pre-integrated tracking solutions (Voluum, Adsbridge and Thrive), all the tracking links and Smartlinks or Offer links will be automatically updated. Data Preferences allows you to select the data that will be displayed in the reports. Just remove the columns that are not helpful to you in order to keep a clean view. I hope this tutorial will help you to navigate on Mobidea from the very beginning! Why is Mobidea The #1 Choice for Affiliate Marketers?